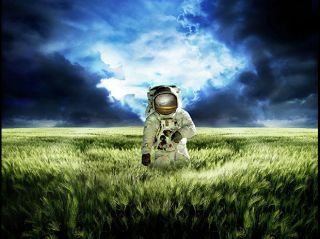 "The Astronaut's Tale," a new opera, plays at the Brooklyn Academy of Music Jan. 28 through Jan. 31. BROOKLYN, N.Y. — This weekend, a new opera about space exploration, the universe's creation and one astronaut's journey will play at the Brooklyn Academy of Music (BAM) — and audience members will be able to talk to performers and astronomers after several of the shows. The 75-minute opera, "The Astronaut's Tale," opens tonight (Jan. 28) at 8 p.m. EST, followed by a special reception honoring retired NASA astronaut Michael Massimino, who launched on two space shuttle missions to repair the Hubble Space Telescope. This is the opera's first full production; Encompass New Opera Theatre put on a partially staged reading in 2012 and is producing this premiere at BAM Fisher's 250-seat theater, complete with a set built around vivid projections of space and the universe's mysteries. The opera was composed and written by Charles Fussell and Jack Larson, and is directed by Nancy Rhodes. The production's website sells tickets and includes a schedule of the postshow talks. Over the course of the narrative, a young man grapples with religious and scientific views of the universe, and is inspired to become an astronaut and blast into space. To tell the story, the opera uses song — four singers accompanied by a chamber orchestra — as well as spoken narration. The show is a multimedia experience: Three projectors display images onto the floor, a wall, and a round, hanging set piece, so the actors are surrounded by views of the cosmos. Encompass New Opera Theatre focuses on bringing 20th- and 21st-century American operas to the theater, and has tackled scientific topics before: Its opera "The Theory of Everything" explored scientific and spiritual ideas about alternate dimensions.